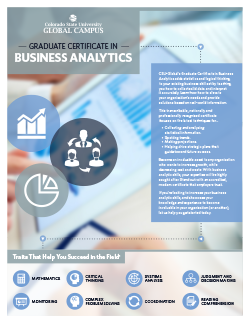 CSU-Global’s Graduate Certificate in Business Analytics* adds statistics and logical thinking to your existing business skill set by teaching you how to collect solid data and interpret it accurately. Learn how to evaluate your organization’s needs and provide solutions based on real-world information. Stand out with this transcribable, nationally recognized certificate. Employers will know that you’ve got the skills necessary to be an asset to the potential growth of their organization. Access the complete business analytics field from requirement collection to emerging topics such as big data and predictive analytics. Develop essential skills in applying data-analytics techniques providing analytical results.